Qipao Love: Part 22 ~ Chinese New Year Cheongsam Wishlist...of the Sheep (Goat) 2015! I've heard about Joli Pretty as a newcomer on the Cheongsam online shop scene in Singapore, and they seem to have some interesting but cute-sided styles. 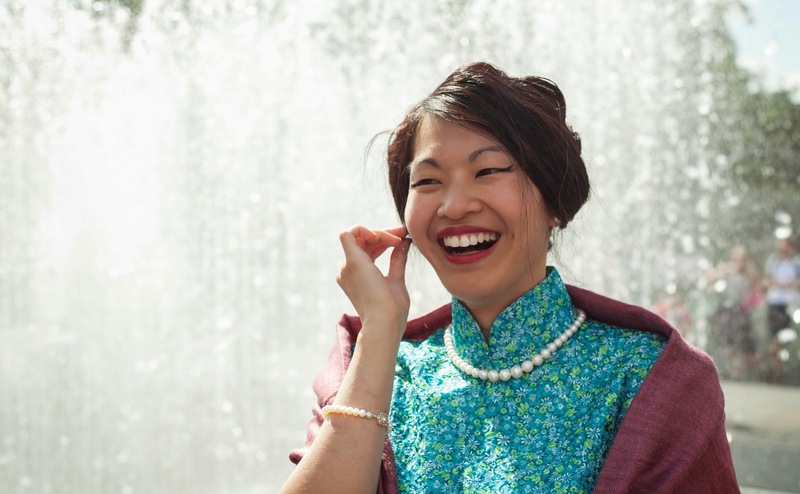 I am yet to try any of their Cheongsam, but this pretty butterfly print Cheongsam with a trumpet flared bottom somehow gives a 1920s vibe that I would love to match with a fingerwave hairstyle to make it truly Flapper! Reader Feedback: After publishing this post, a reader from the UK got in touch to tell me her negative experience of trying to purchase a Cheongsam from 'Joli Pretty', which requested payment by bank transfer without an international IBAN number. Rather than providing the number she was then sent a generic email informing her of the cancellation of order. The reader was very unhappy with the service and stated she would not recommend this shop to anyone. 'Walking in May' response: As I have never tried or tested a Cheongsam from 'Joli Pretty', this post is merely based on my liking of this particular design. (Please note the 'Tried & Tested' statement above) Ann from Joli Pretty has since got in touch to clarify the matter and requested me not to publish reader's feedback on my blog before clarifying with them that it is true. My apologies to 'Joli Pretty' for any possible effects on their brand image, however I feel it important to be honest in presenting both perspectives, as I have a duty to uphold the integrity of my blog and be an independent voice for the sake of my readers. Drop into the vibrantly cool 1960s with this chequered pink and blue baby! I've been a fan of The Lady General's Cheongsam for quite some time, so much so that I have even allowed one of their mini capsule collection to be named after my blog. This lovely shift cut with cute buttons on the mandarin collar with emphasise legs and face whilst skimming over any wobbly bits...need I say more? Despite having over 30 Qipao (Cheongsam) dresses in my collection I am yet to have a red one modern or classic, but this red floral printed modern Cheongsam by Lark & Peony has had my heart racing! Their quality and designs with focus on vintage inspired prints has been a fabulous addition to the online Cheongsam scene. Absolutely tempted to fluff it up with layers of white pretticoat and flowers in my hair.....or wear it as a simple summer dress with my wicker bag! Continuing with the 1950s with this print focused, simple in cut and properly midi Latticework Cheongsam by well established Cheongsam Singapore designer Priscilla Ong Shunmugam. With a Chinese and Indian background, her designs focus onthe play of luxurious fabrics and fusion of patterns to bring alive a bit of modernity in the classic Qipao. Curtains or not, this piece is absolutely swoon worthy and I would love to get my paws on it for a truly 50s spin! As we grow closer to the Chinese New Year of the Goat, I look forward to what new adventures that lie ahead and hope it will be a fantastic year! Also I hope you darlings have found my most recent 'How-To' Qipao video useful. Right...I must get started some sewing to alter a few new Cheongsam dresses for the New Yearand prep for the Zen Yoga class tonight.....have a good week! These are so beautiful! I've loved seeing how versatile the cheongsam really is. So many different styles to choose from! Love the choices! Sorry to hear about what happened with Joli Pretty, I've tried and tested them myself and have to say their quality is there, and happy that their size M fits great for me. However, they are a pretty new shop with some polishing needed. I'm sure they have lots to learn.. so, if your reader doesn't mind, feedback to them as well so that they can rectify it. The owner is such a lovely lady and I'm sure she didn't mean to offend her that way! I've notifed by 1 of our customer about this post. Our big thanks for your lovely review on Charlotte, we will try to bring more lovely pieces like these in :). But I'm so sorry to hear about the negative feedback that was sent to you so this message is to clarify the misunderstanding. I also forwarded to you all the correspondences fyi. As all of you may know, we now only accept bank transfer (i.e. local bank transfer) or paypal if it's overseas customers. So far, our overseas customers have no difficulty in using Paypal to pay us. The order was placed on the 2nd of Feb and I immediately emailed her to inform about our bank info but my bad that this was the first time I heard about IBAN so I told her so (but I did then check and was advised no IBAN needed), also informed her at the same time that she can pay us by Paypal. But there was no reply from her after that. So after 4 days of waiting, we had to inform her that her order was canceled due to non-payment (actually order can be canceled after 24 hours if there's no payment, as advised in our invoice). She then emailed back to send her apology and told us she was busy with her work and we also told her that she can re-place her order. Hope that this long message can clear the misunderstanding. Hope that she can understand as we've experience quite a few of dead buyers who placed order, the dresses were reserved for them but then MIA, whilst our dresses are all made in a very limited pieces (her order was the last one in M size). Once again, thank you dear for the lovely review and really appreciate if you can drop us a note if there's any feedback or anything that we need to improve. Any feedback will be precious to us. To Ai: Thank you dear for your lovely message, which brighten me up. Thank you heaps dear.